Social Security is a topic we’ve been approached about many times in the past couple of years. With a significant increase lately in users who service clients close to or already in retirement, our development team took the time to implement a few new options for “maximizing” Social Security benefits. Maximization could mean a few different things, depending on your perspective, so we’ve given you a couple of different options to best reflect what your clients’ specific needs might be. The first is an option to maximize benefits for total net worth remaining at the end of the plan. By clicking on the “Maximize Net Worth” button, our system will set your clients’ SS benefit start to the age where the client (and their partner, if applicable) would have to take the least amount of distributions from their other assets over the remainder of their lifetime. This could mean that they receive less in total lifetime benefits from the Social Security Administration, but that they dip less into their other assets and therefore preserve a higher net worth by the end of their lifetimes. From another perspective, maximizing benefits could simply mean obtaining the highest amount of benefits possible from the Social Security Administration over one’s lifetime. 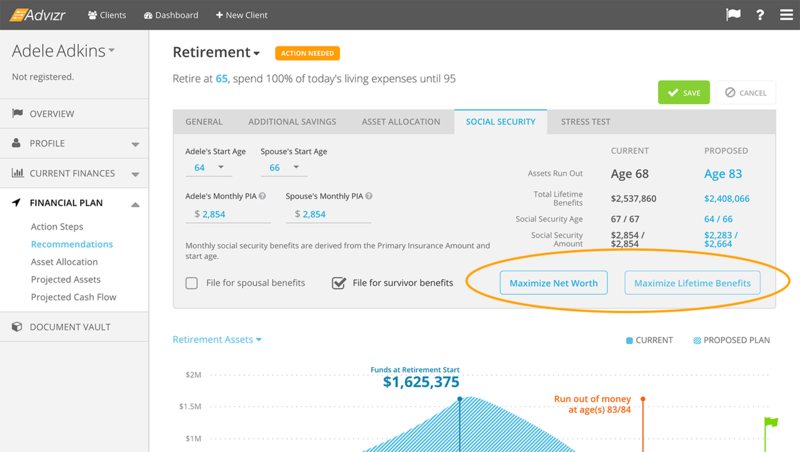 By clicking on the “Maximize Lifetime Benefits” button, our system will set your clients’ SS benefit start to the age where the client (and partner, if applicable) will receive the highest total amount of money from the SSA. This, of course, is primarily driven by the client’s life expectancy, since with a shorter life expectancy, the greatest amount of lifetime benefits would be obtained by starting benefits earlier, even with a reduction in benefits for the early start date. Since most clients currently use a life expectancy age of 90 or above, you will most likely see this function set the start age to 70, which would provide the highest monthly benefit payments over their lifetime. With the addition of this feature, as well as the frequency of requests from our users, we realize that we need to add in the ability to customize assumptions about such things as life expectancy on a per client basis, rather than as a global setting, in order for the feature to be really useful. Keep an eye out on this blog for an announcement when these customized settings become available!